Discussion in 'General DIY' started by bmouthboyo, 16 Apr 2019 at 10:46 AM. Couldn't find a dedicated UK forum for this so thought I would ask here. 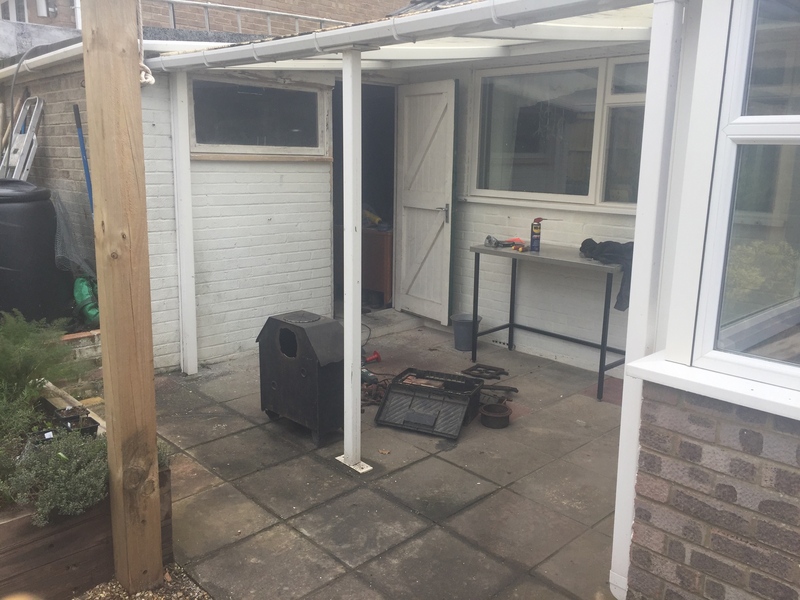 I am making a little outdoor covered area that has walls on 3 sides (garage, house and extension) with a poly-carbonate roof. Want to add a heat source for summer evenings and so picked up this wood burner for £50 off Facebook marketplace locally. I wouldn't mind sprucing it up a bit and will need to fix a few bits as well as add a flume. All the tabs are present but as it is cast is this weldable? Any general advice for restoring it on the cheap? 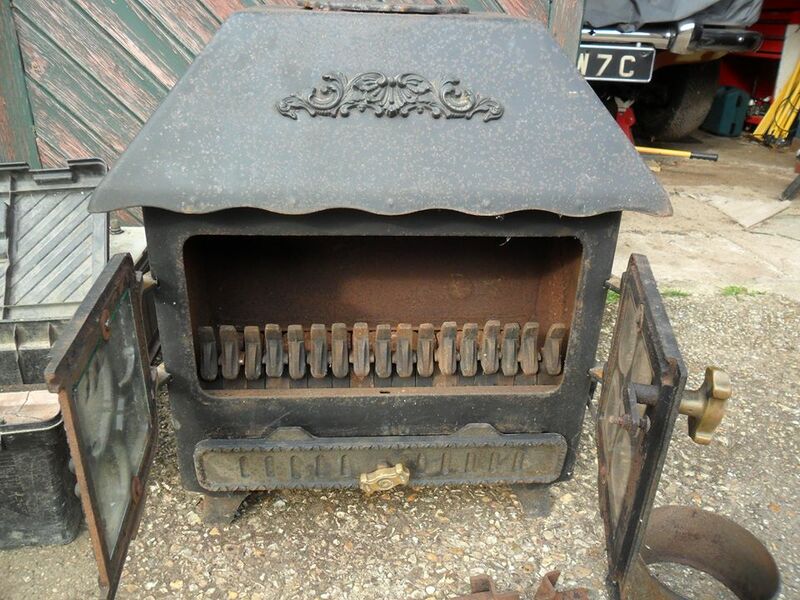 The Hetas website has a lot of advice about how to safely install a log burner. It is not just "stick a pipe through the roof" when installing a flu system. What ever you do spend some money on carbon monoxide alarms. They might just save your life, especially if the fumes from the flu can reach windows in the house.. I like your idea!!! If your extending the flue upwards you may be able to seal the extension in with fire cement. Any idea what you will paint it with? Those tabs are fixable, I don't think anyone would be prepared to weld them though, so seek out an old time blacksmith with oxy acetylene gear who is prepared to have a bash bronze welding or brazing them for you. I can't really see what they are meant to do? The flueing requirements would be twin wall at the very least with an appropriate flashing to go through the roof. Manufacturers such as Morso do their own paint for woodburners but I'd guess any very high temperature matt black paint would do. Is there a large baffle plate on the inside of the stove, covering the flue outlet? Does it have its firebricks, or are we looking at rusty cast iron inside, in the photo? About where it is in that image and there will be a seated bench where the stainless table is. The flue will come out the back and past the poly roofing. Given that it will be out in the elements I am not sure if painting it is the best route as I was hoping to just use stove oil. Is it possible to drill and tap cast iron? That isnt a bad idea as it only really needs to hold it on as I will seal with fire cement. Dead easy to drill and tap cast iron......you could have a piece of bar across the inside of the stove, secured to the faulty spigot. The tabs are wedge shape so lock the collar to the stove when twisted so very difficult and expensive labour wise to get them gripping evenly. Ive done a few by drilling stove body, colar, tapping the latter and bolting up through with large washer under the head which keeps both parts together m6 bolts are my preference. Yep, now that Ive seen what those tabs do, welding is impossible. Cast Iron Fireplace - removing grate polish?